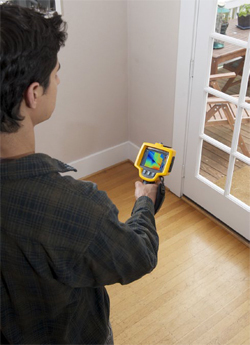 Thermal Imaging is a way to detect energy losses using an infrared camera. This type of inspection allows for our contractors to perform a comprehensive energy efficiency inspection within a home by locating and pin-pointing those areas where air is infiltrating into as well as escaping a home. An infrared home energy efficiency inspection conducted by Southeastern Insulation can be used to verify problems caused by poor design, poor workmanship, or material failure. Your windows may look great visually, but thermal imaging can detect whether or not air is leaking from around the windows. It can also detect missing insulation above ceilings, and much more! Most air infiltrations are located at wall penetrations (such as windows, doors, vents, etc), and at transition areas of fully insulated walls, ceilings and floors. A thermal scan will identify the smallest of insulation breaches and fissures within the concealed cavities of walls and ceilings that would otherwise go unnoticed. With our thermal imaging services, our Atlanta insulation contractors can literally show clients where they are wasting energy – and their hard earned money – so they can get the most out of their heating and cooling systems. Thermal imaging pictures combined with digital photographs can greatly enhance your understanding of just what the problem is and how to go about having it repaired with minimum damage to the home. Southeastern Insulation is in the business of protecting homes and your hard earned money with energy saving insulation services. We are a reliable, local insulation company that offers exceptional customer service and quality results. When you contact us for thermal imaging services or insulation installation, we will ensure your structure is more energy efficient. Over the years, Southeastern Insulation has insulated many different kinds of homes and structures. From commercial steel shop buildings to steel car port storage sheds. Outdoor storage tanks that need multiple steps to complete over multiple days. So whatever type of situation you have, our insulation contractors are experienced to provide you with the best in insulation services. If you’re looking for a professional Atlanta Thermal Imaging Contractor, then give us a call today at 678-561-FOAM (678-561-3626) or complete our request estimate form.